An Individual Taxpayer Identification Number or ITIN is a number issued for individuals who do not have or are not eligible for a Social Security number and have to declare income. The number is issued by the IRS regardless of the immigration status because its sole purpose is for processing tax returns only. U.S. resident alien (based on days present in the United States) filing a U.S. tax return. Dependent of U.S. citizen/resident alien. Spouse of U.S. citizen/resident alien. Nonresident alien student, professor, or researcher filing a U.S. tax return or claiming an exception. Dependent/spouse of a nonresident alien holding a U.S. visa. Form W-7 attached to the front of your tax return (if more than one ITIN needed, attach separate W-7 to the tax return). Tax return for the last year (unless you qualify for one of five exceptions). 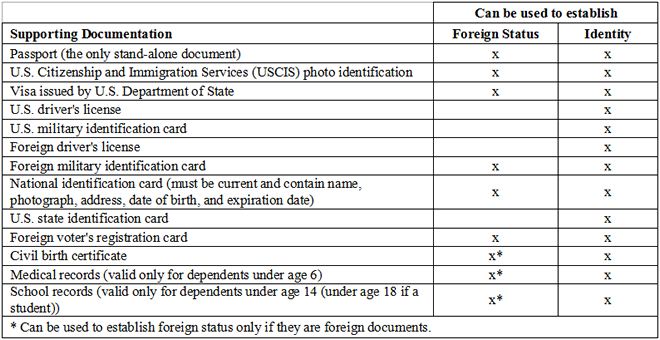 Proof of identity (or certified copies) and foreign status documents. You can apply for an ITIN during any time of the year but if you have tax liability, you may be responsible for penalties and interest on what you owe. Arguably the most convenient time to apply for an ITIN is when tax return is due, this year on April 15th. Make sure you don’t send it to the address listed on any of the 1040 forms you are filing, but instead to the ITIN Operation office in Austin, TX. Abroad – the IRS receives applications in the following embassies: Paris, London, Beijing, and Frankfurt; full-time permanent IRS staff can help with current and prior year tax returns. Mail, accompanied by the combination of the following documents to prove foreign status and identity. Through acceptance agent – an IRS authorized business or individual that can review and help you with the application and can ultimately forward it to the IRS for processing. Publication 1915 is entirely dedicated to obtaining ITIN number and provides examples of Form W-7 and elaborates on exemptions when applying for the number. It is a great source for most questions about ITIN. You cannot e-file your tax return when applying for an ITIN; neither TurboTax, H&R Block, nor any other software will let you apply for the number electronically; tax return has to be mailed – make sure to verify “mail to” address. You can e-file your tax returns with ITIN number in the calendar year following the year in which you obtained the number. Do not file Form W-7 if you have a pending application for a social security number. IRS will not process applications that substitute a SSN or ITIN number with “SSA205c,” “applied for,” “NRA,” or is left blank. ITIN number is not valid for identification. ITIN is not valid for work purposes – it does not change your immigration status. ITIN cannot be used as proof of identification to obtain state’s driver license. Filing state taxes without an ITIN number is not standardized. Rules differ between states and you should check with appropriate state tax office (they all have different names, some are called Department of Revenue, Department of Taxation, Franchise Tax Board, etc.). Common question arises for taxpayers who file as “married filing jointly” where only one person has an ITIN. Because the rules that govern each state change a lot, I suggest reaching out to each state tax division. Some states may accept a tax return with only one individual’s ITIN number (putting “APPLIED” in the space for the other individual’s number), other states may temporarily assign their own numbers until you provide one issued by the IRS, and finally some states will place the return on hold until you receive the ITIN. I have no income for 2013 will I still be able to fill for an itin number?